You are picked up and transfer to Tan Son Nhat airport for boarding flight VN 421 to Con Dao (9.20 – 10:20am). Car transfer to hotel. Check in hotel. Afternoon, trekking through the National Park of Ong Dung Gulf (5km) , snorkelling and swimming. Dinner. Overnight at Saigon Con Dao Resort. 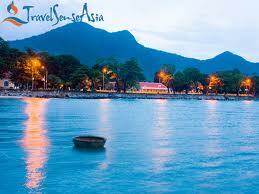 After breakfast, take a boat ride to Bay Canh islet, snorkelling and admire colourful coral. Picnic on Islet. Then enjoy a trek through the magical, time-forgotten mangrove forests characteristic of Southern Vietnam, and discover beautiful coral reefs by snorkeling at low tide. Swimming and snokerlling at Bay Canh Beach. Back to your hotel. Overnight in Con Dao. Visit Dam Tre Gult , a beautiful beach for swimming here. Back to hotel. Transfer to airport for boarding flight VN422 to HCMC (11am – 12 noon). Flight tickets Saigon- Con Dao – Saigon on Vietnam Airlines, economy class.